Digital technology is a great way of capturing and sharing the important moments in life – videos of baby’s first steps, pictures of the first day in school, a travel blog, … and QR codes in gravestones. Earlier this month, BBC news reported that a Danish gravestone manufacturer started selling plates with a QR code linking up to information content about the deceased, including audio and video. 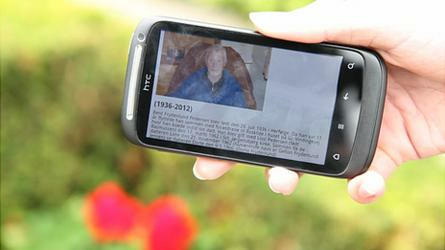 This is not the first use of QR codes in cemeteries, as I discussed in this post. What I found interesting in this particular article was that the service is touted to be a great way to tell the person’s story and preserve local history. For instance, the company’s director is quoted as saying: ‘It’s a good way to tell the story of a person. And we all have a story.’ But… see… We don’t have a story. We have several. This news article reminded me of a very interesting paper presented at the Academy of Marketing conference in July 2012, by Robin Croft (@robinjazz). The paper is available here and reflected on the author’s experience of using various web 2.0 platforms, including Myspace, Bebo, Google+, Facebook, Twitter, LinkedIn, Xing, Plaxo, Flickr and Youtube, among others. Robin defended that users of web 2.0 platforms used those tools to tell a story. The story told in each of these platforms varied greatly, partly because of the technical characteristics of the platform and partly because of usage protocols (the netiquette). Most importantly, though, the different stories reflected the nature of the connections in those platforms – e.g., personal vs. professional contacts. The author suggested that users ‘tried to adapt (their) personal ‘brand’ through occasional updates such as describing the projects we were working on’. Moreover, he noticed that it took time to find one’s voice in each medium, distinguishing between having an audience and engaging with it. What I found most interesting about Robin’s paper was the proposition that, in social media, there is no distinction between the person sharing the content and the audience. As he wrote: ‘the distinction between audience and artist is largely irrelevant: the conversations are co-created, be they mediated by jokes, pictures or general chitchat’. The author concluded that ‘the audience controls the medium, and invites products, services and brands to contribute on his or her terms’. Now, I am at a crossroad. On the one hand, I expect brands to be present on social media and interact on users’ terms. On the other hand, I also expect brands to have a consistent presence. Any thoughts on how to reconcile these two different needs? Interesting and thought-provoking post, Ana. I think to answer your question, the proposition to focus on from the paper you mention, are the differences between the platforms. As a simple example: I expect brands I follow to tell me about them and their story or stories on a platform like Facebook, maybe using YouTube/Vimeo as a supporting platform to host video. On a platform like Twitter I would expect them to be very responsive to my questions for them (and those of other customers, of course). If you add LinkedIn, there I would like them to share interesting positions with me for which I might be able to apply. True, but the difference between you and a company, is that people on your FB network may not be on your LinkedIn one – so, their perception of you is very consistent (if limited). I think that managing this presence across platforms may be a more difficult for companies. But, then, again, Personal Branding is the new thing, right? Oh, I don’t think it’s easy, but because I (and with me many other consumers) use these platforms in different ways, I think it’s important for companies and organisations to realise that and… match the behaviour. Social media has turned the communication between organisations and their customers more into conversations, and to have a good conversation, it’s important to know how and where your customers want to have that, and act accordingly. With social media, the roles in the communication are more equal and balanced than in traditional one-way marketing. Hopefully, yes. Still, it’s the ‘just getting it right’ across so many platforms with different characteristics etiquette, audience, etc that must be tricky. From today’s Guardian: “We don’t read things, watch things, or listen to things in the way we used to.” (http://www.guardian.co.uk/media/2012/sep/16/2012-mediaguardian-100-overview.) It used to be that we had to consume brands conspicuously for them to make any sense but now we can express our personalities and aspirations with ‘like’ buttons. The Porsche 911 was the first brand to have a million followers on Facebook: a million Porsche drivers? I don’t think so. As Arjan says, Porsche helps them tell their stories. I Agree with Mrs. O, Social media humanize the brands, at least the ones that know how to use the SM tools in that way and not just as a content information about their own products and services. I am amazed! 🙂 eheheh thank you for sharing this slide share.